Hi, Im Ariel and this is Koda, he is now a year old. He has an awesome personality that would make you think he was the size of a Great Dane. He loves to play with our cat and be in the most inconvenient places at the worst times. He is the sweetest dog I have ever had and he loves nothing more than protecting his yard, home and the ones that live in it. His father and mother are from Germany and Hungary. 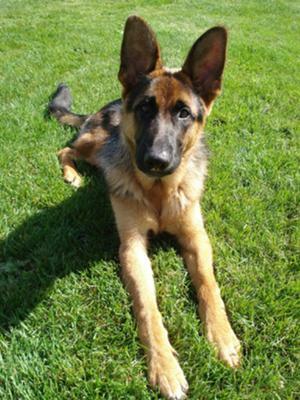 Thanks so much for sharing your story of your German Shepherd Koda with us all here. I once had a Coda too several years ago - the biggest momma's boy you could ever ask for at 110 pounds! Your boy is gorgeous! And his ears are so pretty too. He looks to be a healthy little rascal and if he's anything like most German Shepherds he'll be a mischevious little guy for a while yet. My boy Rodie, likes our cat too (unfortunately the cat does not feel quite the same) so that can just be one of those issues that you just have to be aware of. They will work out their issues over time - but it will be better when your boy matures and is not so puppy-like. Good luck with sweet little Koda. He will be a great companion for you for years to come. Love those big ears! What a handsome boy Koda is. He is getting bigger and filling out but he is still a puppy. You have so much fun with him. He is already protecting what is his; yard and family. Shepherds, that what they do Protect; its in their blood. I notice it in Mia when she was 8 months with that stong voice, woof woof woof, you not coming in my yard. You read our story GSD puppy Mia and Mia My Beautiful German Shepherd Dog. Take care of your boy and he will take care of you! Thank you sk very much for sharing your story about Koda. He is such a special, & handsome German Shepherd! I have a German Shepherd, Chloe; she will be 1 yrs.old, on June 29th. I know that Koda brings you much happiness, just like , Chloe does for us.